Here’s a guide on How To Fix Server DNS Address Could Not Be Found Error in Windows on a web browser. This error used to occur on my Windows laptop often, especially on Google Chrome web browser, But after searching for various solution method on the internet i came across some interesting fixes for the issue and luckily they permanently fixed Server DNS Address Could Not Be Found error on my Google Chrome for Windows. When this error appears on a web browser on Windows device, you see following error message shown in the image below. 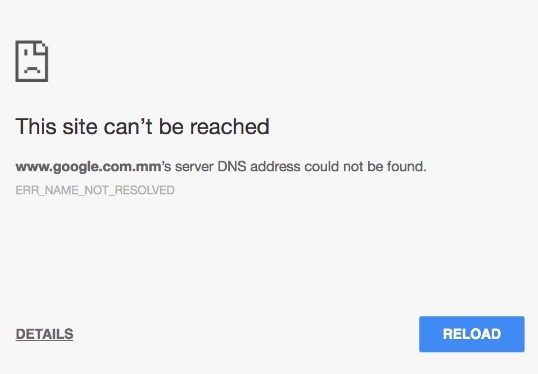 The DNS Server address error could happen when you try to access a webpage before the router or modem got connected properly to the internet. Try restarting the device to see if that works. If not, don’t worry, we have simple solutions below that will help you to fix this server DNS address error could not found error on Windows 7/10/8/8.1/XP/Vista running devices. In some cases, even if you access the domain, it gives the same error making it difficult to access the site. When this error occurs, some domain might work while others remain stuck. Sometimes even restarting Google Chrome browser doesn’t fix the DNS Server is not responding or server DNS address not found. If you’re facing any of the above issues, see instructions in the guide below to learn various ways to fix DNS server issues in Chrome for Windows. First thing you could do is to flush and reset DNS to see if that fixes the issue. Otherwise, use the GUI repair the adapter setting to repair network connection. This method may be a bit technical but it saves you the hassle of booting Windows again. For an easier method see the steps in the solutions manual below. After entering the values above, check the validate settings upon exit option and hit OK.
You must also enter the DNS address in the router configuration. Try to open the site in Incognito Mode, press Ctrl + Shift + n shortcut for it. If it opens, the problem is likely with an Extension the source of the problem. Enter chrome://net-internals/#dns in the address bar and click the clear host cache button. Open Windows command (press ctrl + esc and enter cmd) and type ipconfig/flushdns command. Reset internet router and turn it off for about 10 minutes and turn it back on and wait for few minutes. Boot your PC and check if internet connection is back on which might have caused the DNS server address problem. Delete browser cache and cookies. Enter Incognito mode in Chrome. Try disabling extensions one by one to identify which one is causing this error. For that, go to Chrome://extensions and uncheck Enabled for each extension one by one. Go to Menu > Settings > Advanced Settings > Under ‘System’ uncheck the Use Hardware Acceleration When Available option. All done. these are the best known solutions to fix server DNS address could not be found error on Windows and Chrome browser. Send comments for questions.